A cult figure, novelist, short-story writer, poet and journalist. 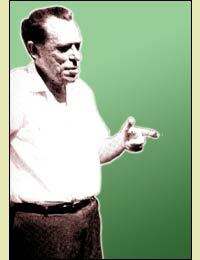 One of the greatest writers to come out of Los Angeles, many consider Bukowski to be a true voice of the city of angels. Bukowski, also known as "Buk," wrote with raw emotion and painted with words. His canvas was Los Angeles. Not the glitter though. His Los Angeles was the stench of alley-ways, broken dreams, broken hearts, winos and of course...the horse track. 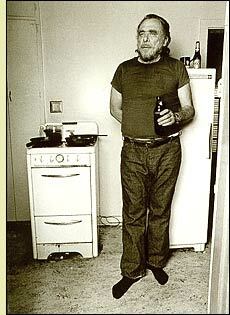 Bukowski was born in Andernach, Germany in 1920 and brought to the United States at the age of three. He was raised in Los Angeles and lived there for fifty years. Buk published his first story when he was 24, "The Aftermath of a Lengthy Rejection Slip," but spent the next 10 years of his life drifting from city to city, deluging his body with pills and booze. As he said, "I packed it in. I threw away all the stories and concentrated upon drinking. I didn't feel that the publishers were ready and that although I was ready, I could be readier..." This would land him in the charity ward of the Los Angeles City Hospital suffering from severe internal hemorraging. After his near brush with death, he started writing again, using sleazy bars, dirty beds and indulgence in women and alcoholism as landscapes for free verse stories and poems. He published more than 45 books of poetry and prose in his life-time.